Jessica Tom captures the psychology of NYC’s elite dining scene in her aspiring debut. Jessica Tom is just a regular girl trying to make it in the big city of New York. 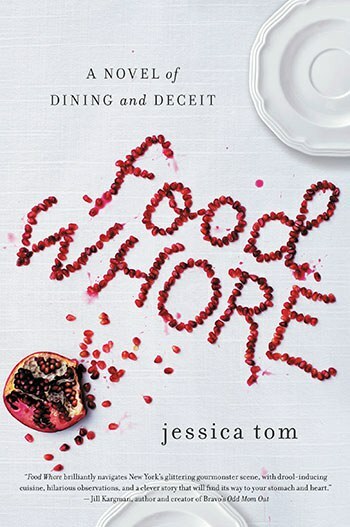 Wait—that’s Tia Monroe, the main character in Jessica Tom’s debut novel, Food Whore, not Jessica Tom herself, right? Kind of. There's a definite whiff of The Bell Jar in Food Whore. While Tom deserves full credit for nailing the psychology of elite dining in the dark metropolis, she goes after it with such a precise and earnest telling-not-showing that this reader ultimately felt the author must still be ranked a diamond in the rough. But a debut novel is like a restaurant that’s only been open for two months—nothing quite gels until the third month, for whatever reason, and I’ve seen enough potential in Food Whore that I would come back to a second book from Tom to see how her promise shown here can mature. I mean, I would even order that second book because it’s likely to come with a hilarious token gesture of marketing. This time, it’s a temporary tattoo that says “Food Whore”, though it doesn’t quite mimic the title font on the book cover. On the FAQ page of her website, she tells you not only how to get an agent, but also what brands of makeup she wears. In a way, the gorgeous publicity Tom has already garnered underscores the fact that she knows what she’s talking about when it comes to the VIP hospitality experience in New York City. The author has a tight grip on what we can call the “human cost” of being a restaurant critic. If you write something positive, really positive, that business gets a bump. If you write something negative, that scrambling business loses steam, which puts jobs on the line. If you write something with too much personal investment, you’re flirting with journalistic integrity. If you write something for personal gain, you’re being unethical. Tom’s naïve, climbing protagonist faces these exciting, realistic challenges in ways that are too often sadly predictable. The author’s best writing doesn’t show up until midway through the story. She gets a bit of a slow start, mapping out the pieces to her story, but she does a fair job of pacing out the second half where all the action is. Some of the secondary characters have quick, disjointed introductions, then stand around as somewhat cliché characters that are mere placeholders until they're needed for their role in driving the conclusion. But their motives, their feelings toward Tia Monroe, are always clear. Then there's the New York that is New York. Tom thoroughly and thoughtfully conveys how bourgeois knowledge is learned through socialization and favors. It’s not controversial to state that New York is indeed a city of dining and deceit. Every aspect of an aspiring four-star restaurant is crafted with obsessive attention to every detail, and rapt attention is paid to every adjective applied to that restaurant in a hoped-for New York Times article. Such an article, of course, could determine the Next Big Thing. Tia Monroe basically blows up her life plan in order to experience the Next Big Thing as quickly as possible. In true New York fashion, however, she grows up enough to discover that she was as much beholden to chance and greed and lust as every other nice young lady to march across the pages of social satire since Jay McInerney. Food Whore is often said in the same breath as The Devil Wears Prada, and that feels apt to me. On this first go at a novel, Tom conveys something more brave and daring than standard “chick lit"; there's enough fresh subject matter and psychological analysis here to pique readers' interest in her work. But I want Tom to up the ante to Paul Auster territory, another reflective New York writer who prefers to tell—in the most unblinking, painfully level-headed fashion—instead of show. The lessons of Food Whore are dark ones, and Tom ties them up nicely with all the bells and whistles of a satisfyingly modern happy ending for the protagonist where all the liars and sell-outs get their comeuppance. Tia Monroe will be older and wiser next time, sure, but she comes away from the events of this story implausibly unscathed. This is a fine book to read at the beach (I say, writing in December), or at your kitchen table with a glass of wine in hand when you’d rather be at the beach. Industry people who read Food Whore will easily (and perhaps with pleasure) project their feelings -- and their coworkers -- into the food service psychologies on display here. Tom's mission is a sound one, though the spotty execution of Food Whore does leave a few things to be desired. Still, this is fertile territory and she shows a lot of promise. A lot of people will like this book if they don’t expect too much from it. I expect that Tom’s next project will be nearer the mark of a four-star rating.